Professor Plum, in the conservatory with a revolver. I haven't thought about Professor Plum in a million years. The other day at my in-laws' house my mother-in-law asked if I wanted to have one of Tim's old games, Clue. We took it home, dusted off the cover and started playing with the family. I think it's strange to play a game where the whole theme is murder. I mean that's kind of weird isn't it? But I loved this game when I was younger. As we we tried to guess if it was indeed Professor Plum or Miss Scarlet, I was kind of overwhelmed with memories of being a kid. I loved being a kid. I vividly remember sitting in my bed with the pink canopy asking "why do we even have to grow up anyway?" I remember winters full of sledding and snow forts and cross-country skiing with my brother, sister, mom and dad. I remember family picnics and softball games in the summer. I remember road trips in the station wagon and winning the right to stretch out in the "back-back" or the floor (Which I say a big what the hell? to now, because who wants to lay on the car floor, how weird!) Sitting in the backseat (or laying on the floor) listening to my mom and dad sing old camp songs, not just sing, harmonize. Staying up late on Friday nights to watch Dukes of Hazard, Dallas and if I was super lucky Falcon's Crest (I know, go ahead and say a big what the hell? to why my parents were letting me watch those shows!). Staying outside all day playing with Beth, Amy, Jessica, Steve and maybe Jason if he was around and Richie, but he was kind of know-it-all. There were family walks--even our mean old cat, Furry Socks, followed us. Talent shows in the front yard, Christmas plays that always ended in family dance parties to Michael Jackson or Chaka Kahn songs. When the tax refund check came in the mail we got to go to Mr. Steak and celebrate. My little brother and I couldn't wait for my dad to get home every night from work and when his little tan Festiva pulled in the driveway we'd run out to greet him with hugs. Playing Green Glob, Ghosts and Graveyards, Hide and Seek, Rook, Clue and Hearts for hours and hours. I never wanted to grow up. Until a few years later when all I wanted to do was grow up already, geez. About four years, maybe five. That is the length of my magical childhood memories. My particular childhood/family ended because of a divorce and all kinds of weird dysfunction and sadness. BUT it would have been changed no matter what because all kids grow up. We all grow up. So, I watched my kids play a good old-fahsioned game of who murdered who with what and heard the classic Natalie Merchant song in my head. You know, "Theeeeese arrrrre days, you'll remember..."
Peyton is trying to make sure no one sees who he thinks the murderer is. We made Lucy wear gloves because she was still in the post-Norovirus contagious time-period when we played. I hope my kids look back with all kinds of warmth and joy when they think of their childhood, these days. Even if we totally screw up their teen years, I feel pretty good that they have a solid foundation of good times and now Clue to hold onto. We found this little note when we opened the Clue box. Apparently, Tim was a fan of the L.A. Raiders 30 years ago. 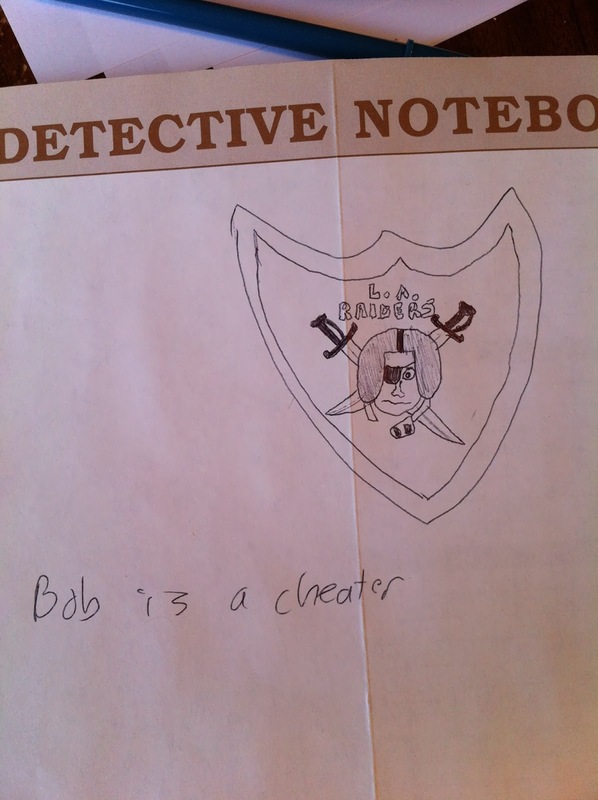 And he thought his brother Bob was a cheater. 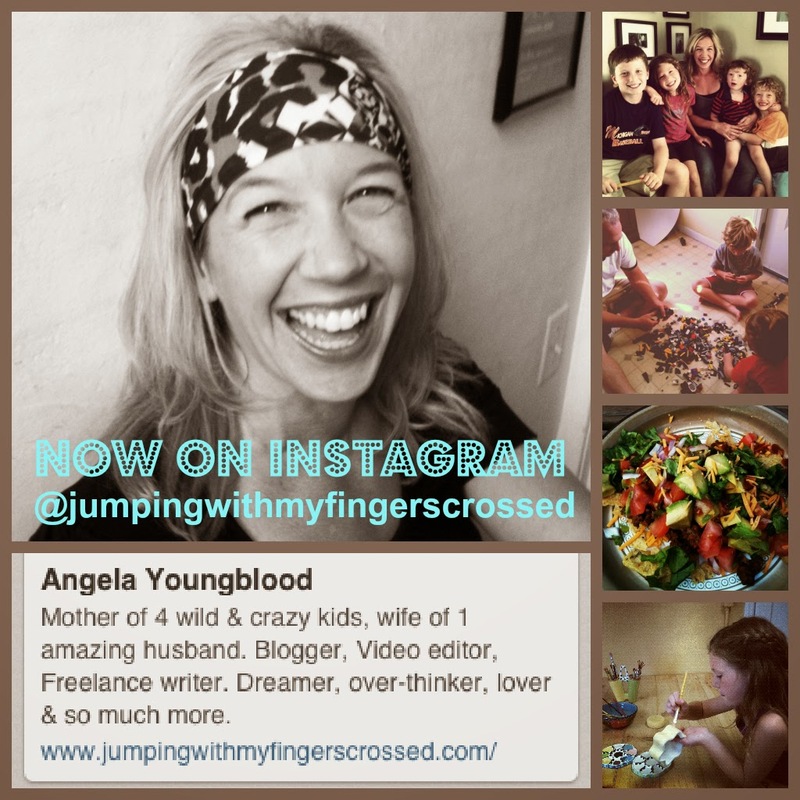 I love this so very much, Angela! 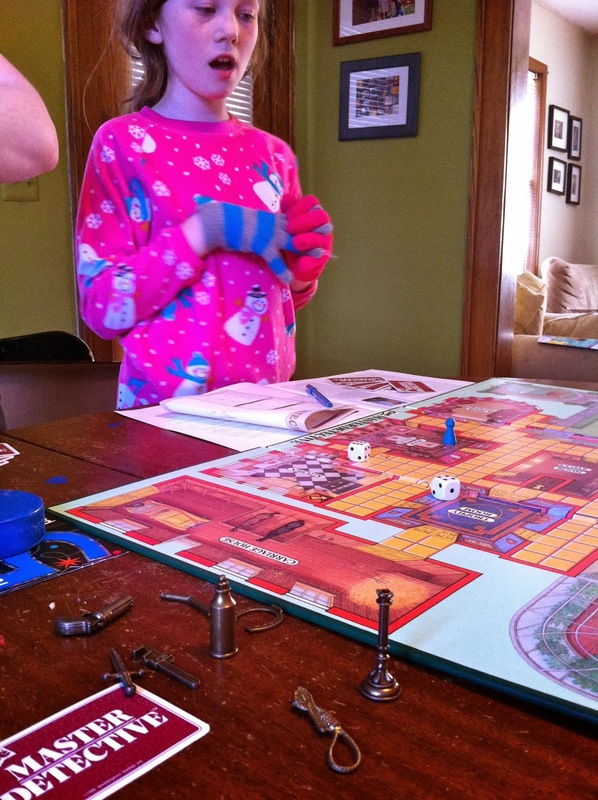 I loved Clue (A LOT), too and that wistfulness for how I hope my kids remember their youth? I know that, too! I remember my childhood of playing board games too. And I loved Cluedo. I think you're a great Mom, your children will remember these days warmly, I'm sure of it. I still love some board games. 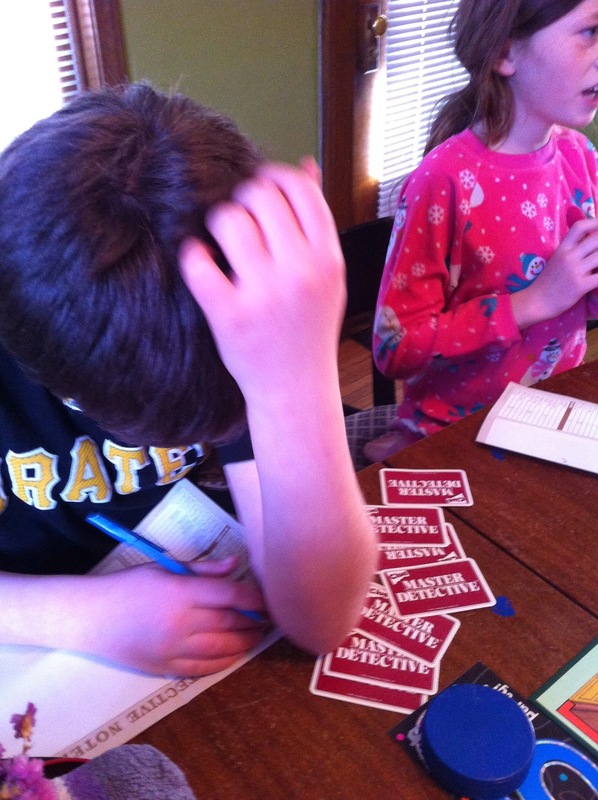 And my kids do too - now I'm feeling inspired to play some Clue! I'm constantly striving to give my kids childhoods with awesome memories - especially of little day to day things, even if we don't take big trips and do a lot of BIG memorable things. Sometimes I think we remember the little things more. And you've also just reminded me how much I love some Natalie Merchant! Oh, I loved Clue! I used to play it; I remember the movie, too. But now that you mention it, it is kinda strange to base a game on murder. I had the same thoughts when I was growing up - I didn't want any part of it for a time. #1 - I LOVE Clue. #2 - I think of a line in The Breakfast Club often. Now I don't remember it exactly, but it's something like, "Everyone hates their parents. If we didn't, we'd live at home forever." I really hope my kids remember good things like board games or the games we've made up on a whim (who can name the most homophones? I WIN EVERY TIME!). I have to admit I don't like the new Clue or the new Life (you can't even choose your own profession!) but my memories of the original games are still there. If my oldest daughter were to leave a note in a game box, it would absolutely say Zoe is a cheater. I remember late night talent shows and running to bed, falling on the way, screams of ow and peals of laughter as we tried to outrun our mother who'd told us to go to bed hours before. I remember bobbing for apples at our neighborhood Halloween party and being pushed into the tin canister as my head was under water. I hope, I pray, that my kids remember those sorts of things too. I love the peek into your childhood! I know you have plenty of not-good memories from growing up, so it makes me smile to know about the good ones, too. And I can guarantee that YOUR kids have a whole MESS of good memories to grow up on! I haven't played a board game in ages! I think if I'm not too stingy, I might pick up a few games at the store next time I'm there. It's just that.....I'm waiting for my kids to grow up so we can play! LOL. 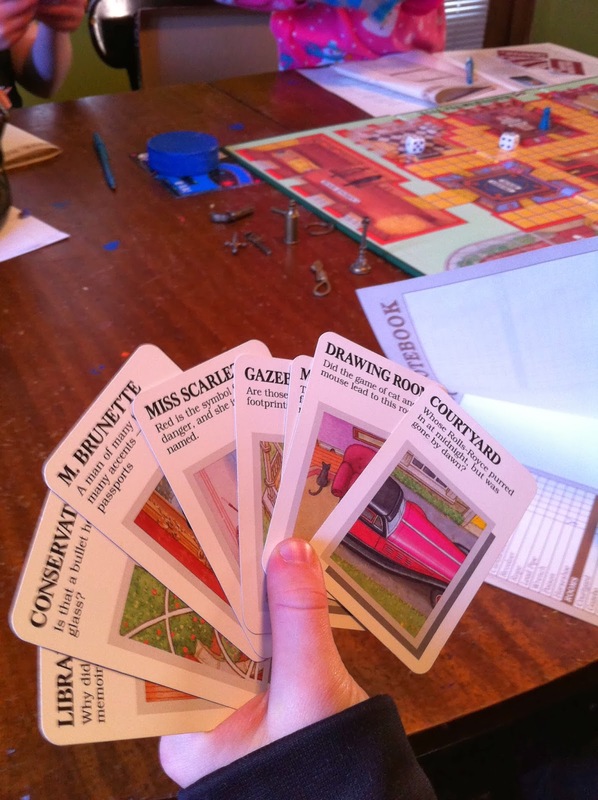 I loved Clue, too, and I never thought about how the game is centered around murder. That IS weird.